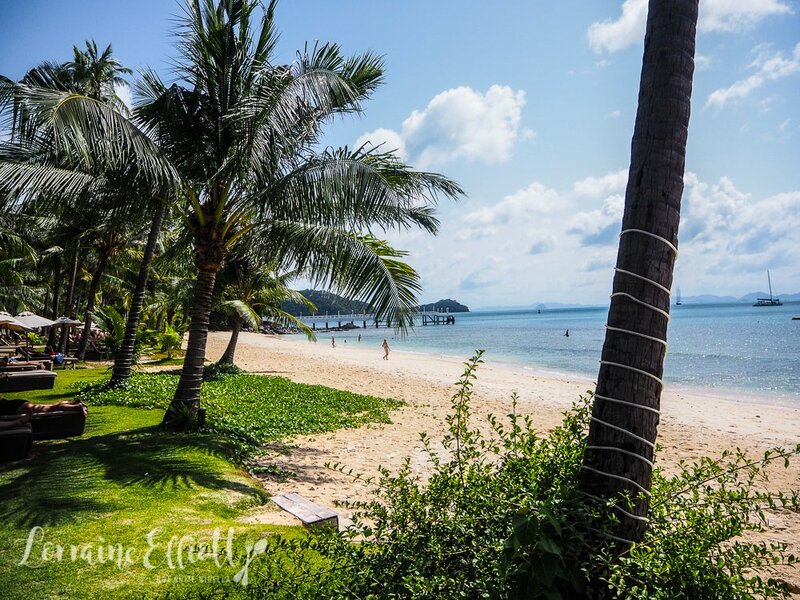 It's time for our annual migration to warmer climates and this year it's a stay in the Southern part of Phuket at Cape Panwa. 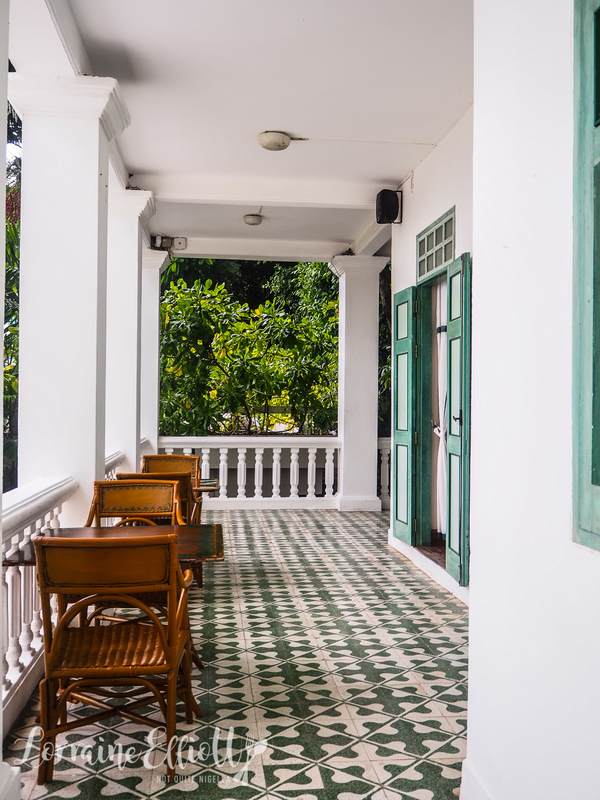 It's a feast of food with a stay in a signature suite, dinner in an original Sino Portuguese mansion and a cooking class. 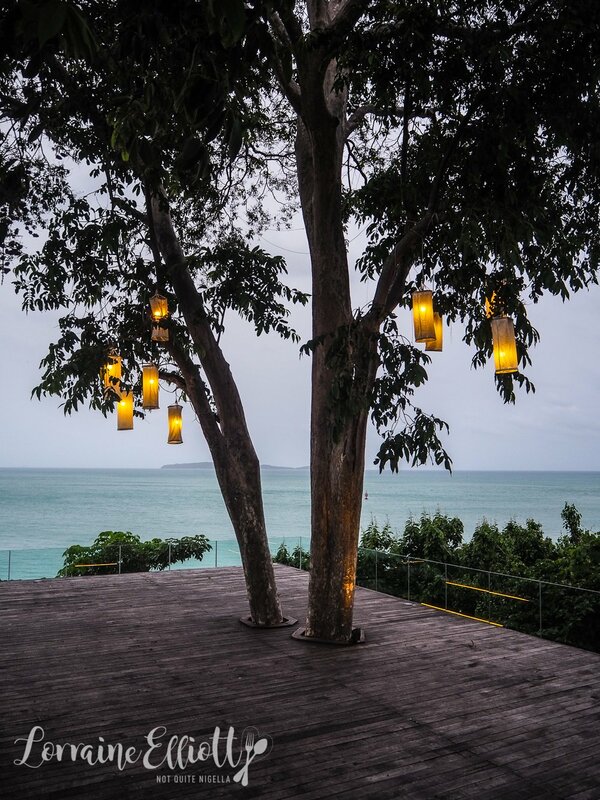 Cape Panwa is located on the South East side of Phuket and it takes around an hour to reach there from the airport. 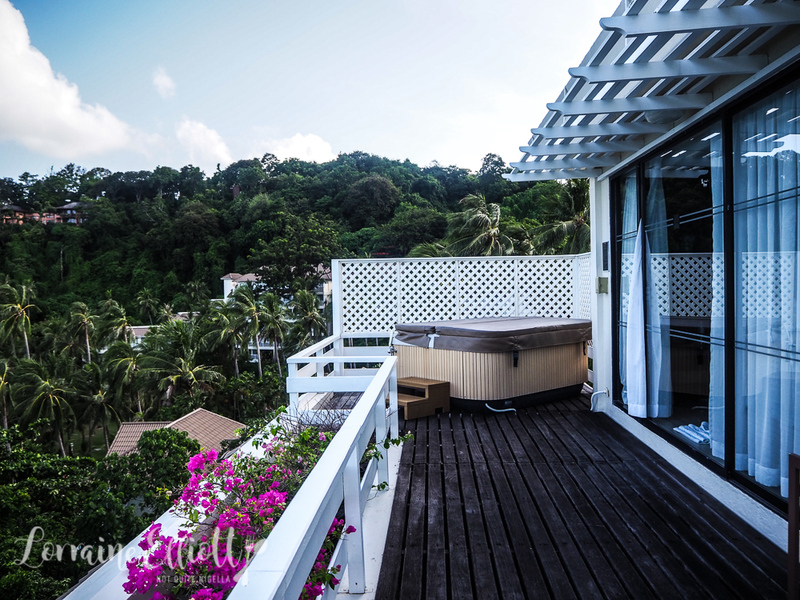 A 1am Sydney time arrival in Phuket is a bit discombobulating but Cape Panwa staff graciously speed us through the process and we are whisked off to our suite. 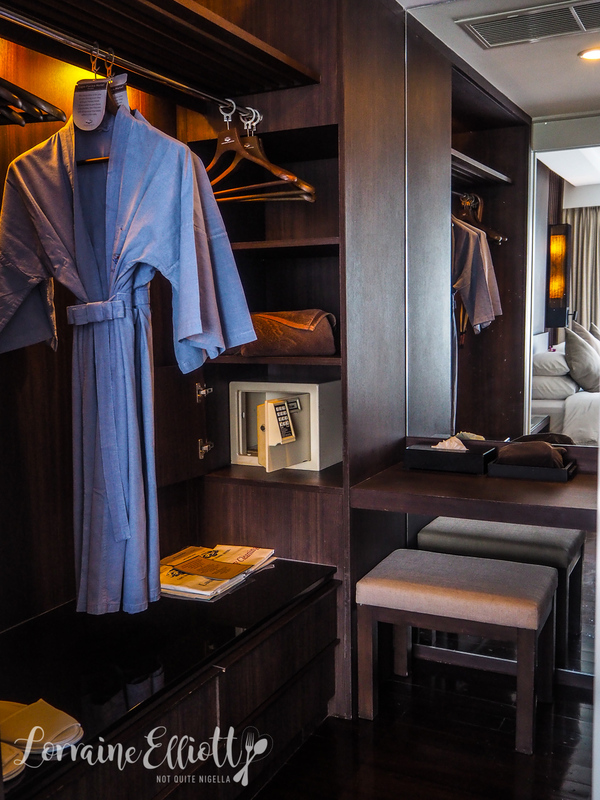 Our suite E304 is a signature corner suite and it's enormous. 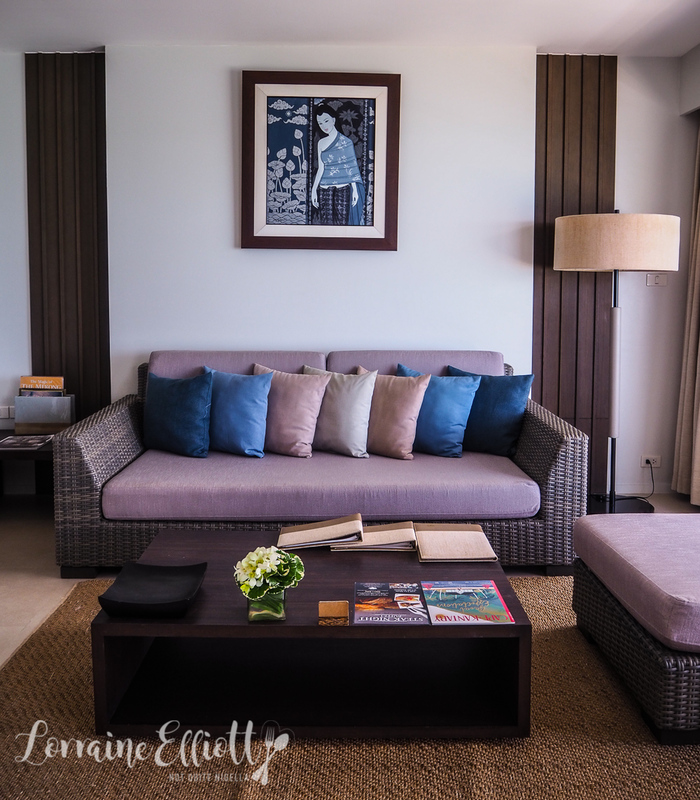 It starts with a lounge area and a guest bathroom. 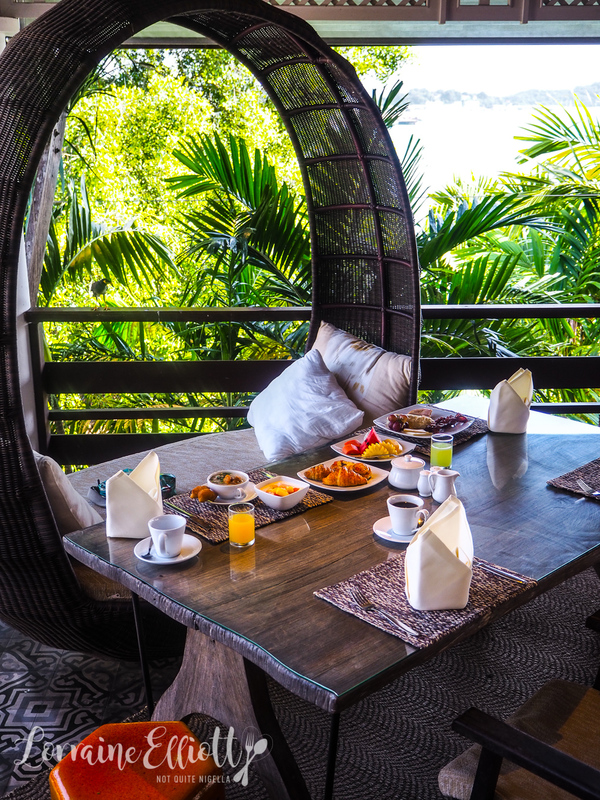 There's a welcome fruit bowl on the table and a comfortable day bed to lie back in. The main bedroom has two beds together that makes the bed absolutely gigantic. The bed is on the firm side and there are large pillows and smaller ones and I end up ordering some smaller pillows from the pillow menu. There's a work desk as well as a dressing table and mirror. The bathroom is an ensuite with a spa tub and a separate shower. There are two sinks, gorgeous smelling toiletries by Thai brand Erb and there is also a skylight in the bathroom. The spacious wrap around balcony is hidden behind the curtains. Outside there is a jacuzzi tub and a lounge. I fall asleep after a long hot shower and wake up at 7am. The sun peeks through the edges of the curtains and I pull them back. 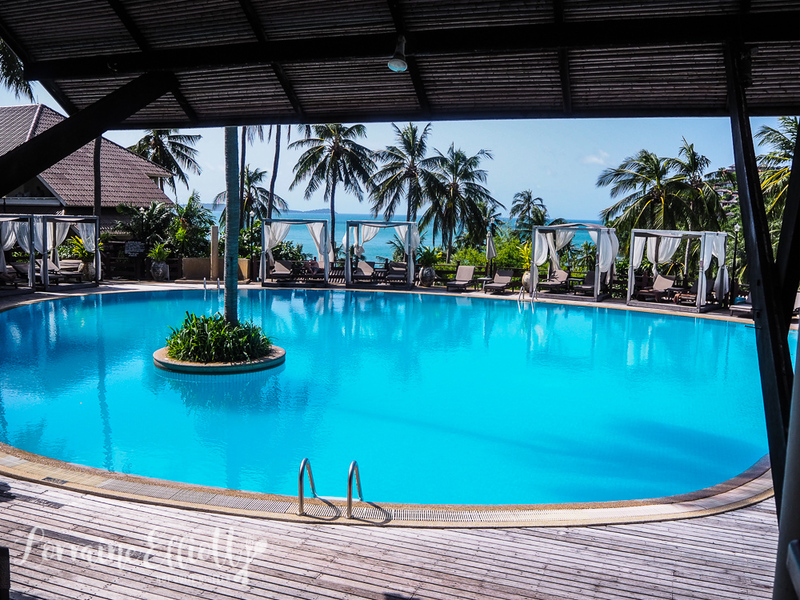 "Wow," I say out loud waking Mr NQN with my exclamations and the beam of sunlight that floodlights the suite. Blinking several times I wonder if the colours of the Andaman sea outside are real or just a figment of my imagination. A small boat makes its way across the lightly rippling water, a solo traveller in the morning. 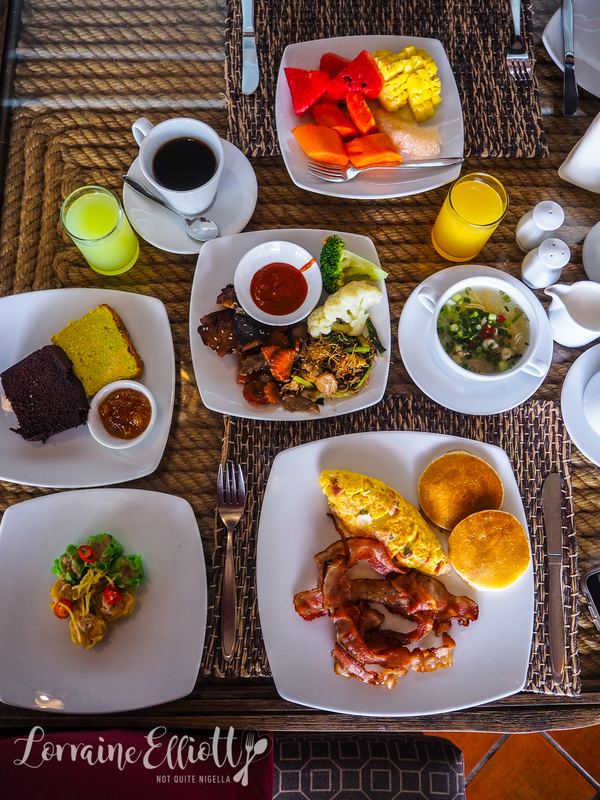 Breakfast is served from 6:30-10:30am every day. 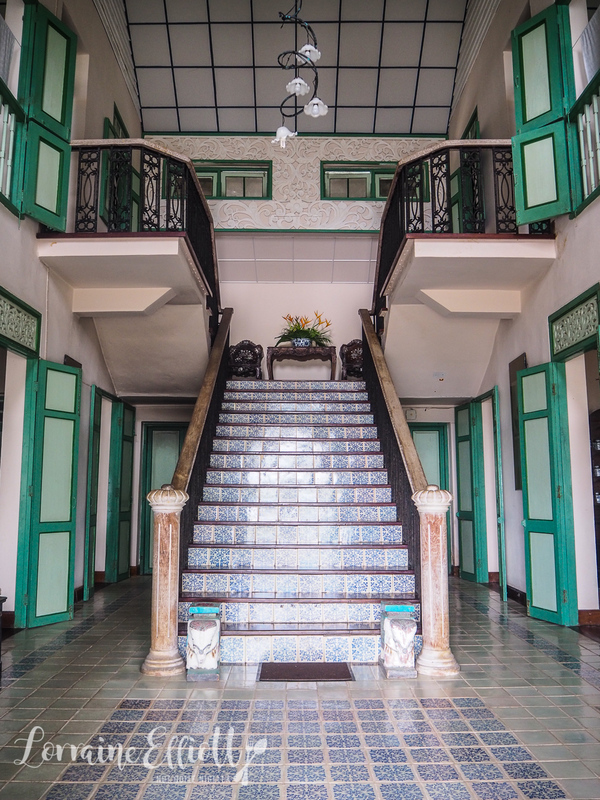 The hotel has 205 rooms and suites although the main eating areas and accommodation are within easy walking distance. We take a seat in a basket chair and help ourselves to a selection of food. 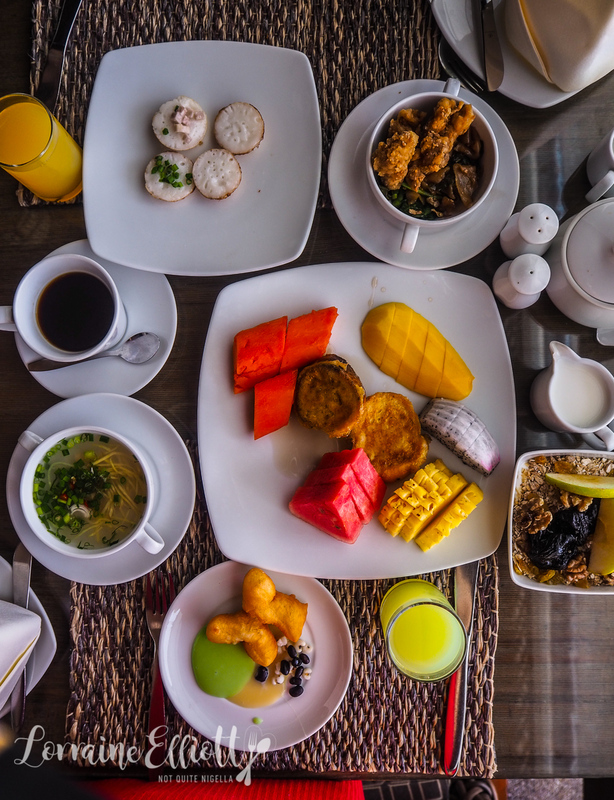 There is a fresh waffle and omelette station as well as freshly cut fruit and a range of cheese, charcuterie, hot Asian foods and Western breakfast offerings. As we will be here for five nights, I try to limit myself but end up getting a lot. My favourite is the pork congee with plenty of ginger, spring onion and chilli fish sauce. Mr NQN feasts on the fruit platter, yogurt and pastries while I go back for seconds of the congee. 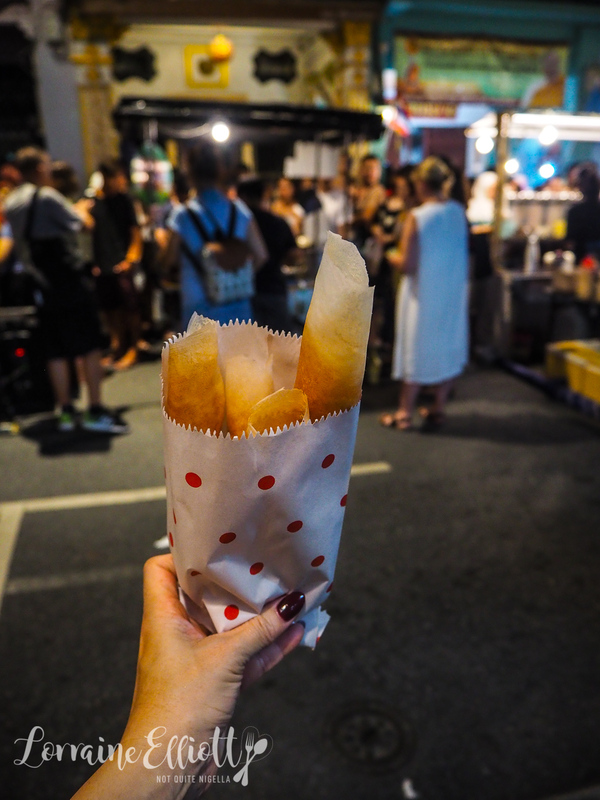 There are a few things that change every day and on other days I try some crispy coconut cakes, waffles, some fried dough sticks with pandan custard and sweetened condensed milk. There's always a hot Asian chicken dish as well as noodles and fried and steamed rice. 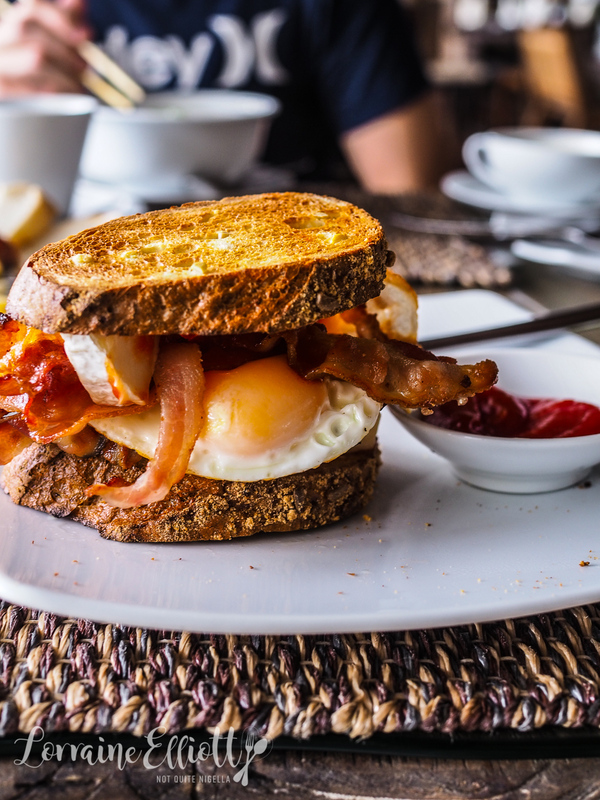 I also discover the soft bacon (which is still crispy) and make myself a sandwich with a brie, edam and cheddar cheeses, a fried egg, plenty of bacon and Tabasco tomato sauce-delicious! 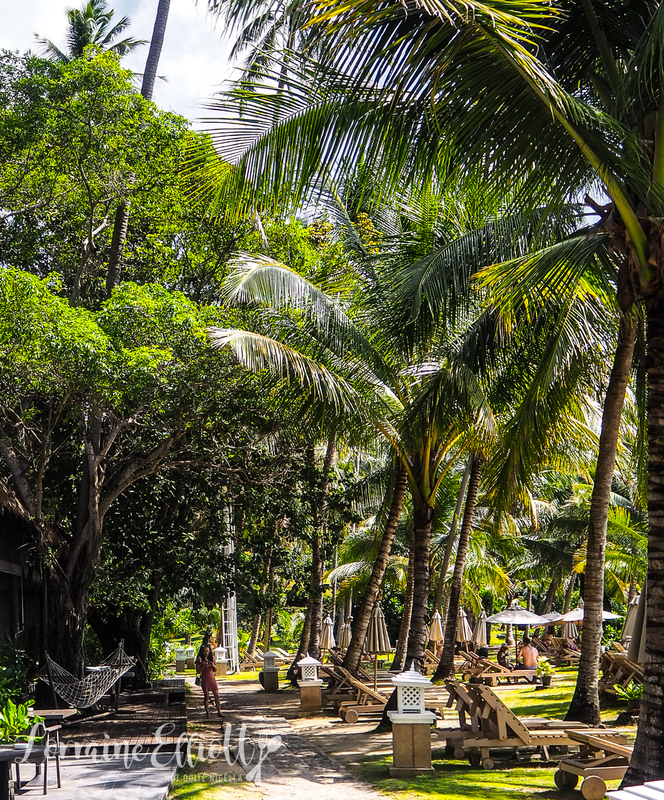 It's time to explore the resort in the daylight so we head towards the beach. 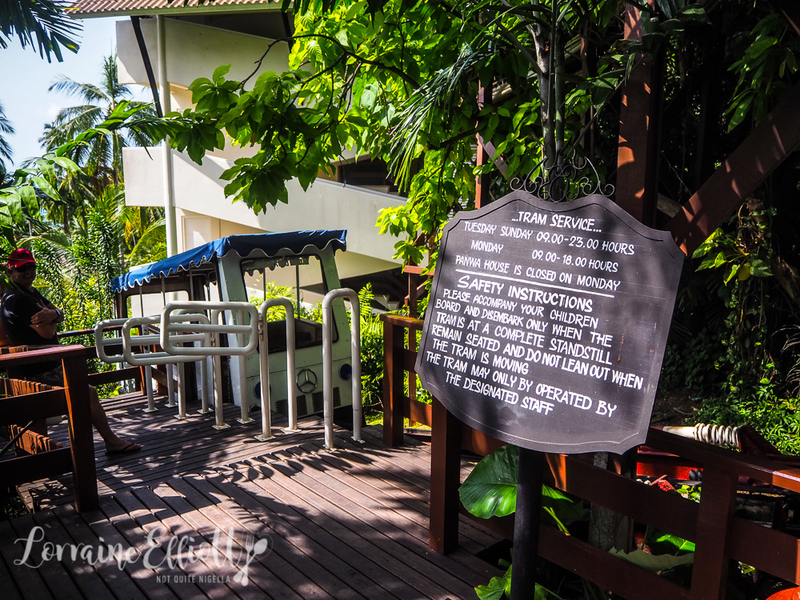 Access to the beach is via two ways: via the steps or you can take the little tram that goes up and down to the beach. 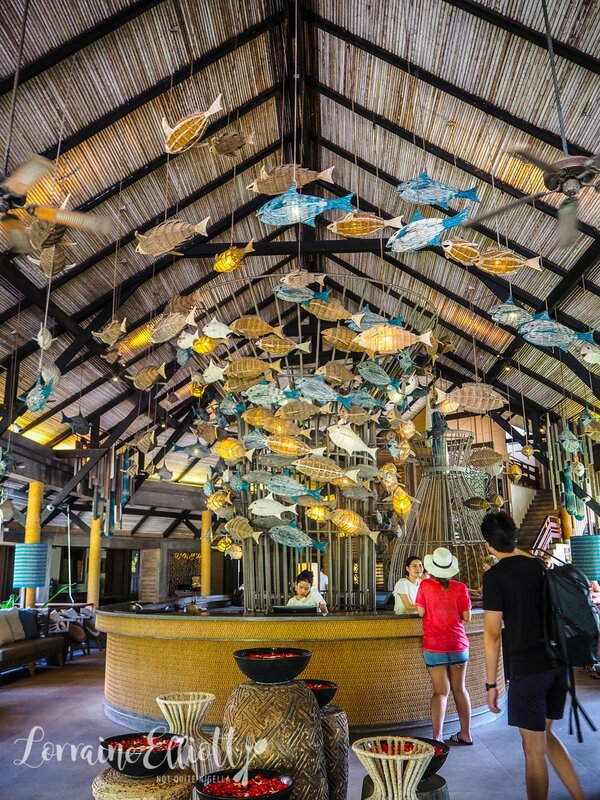 Here there is the Bamboo Bar and lots of lounge chairs to relax on. It's Mr NQN's birthday so we spend the rest of the day doing things that he wants to do. 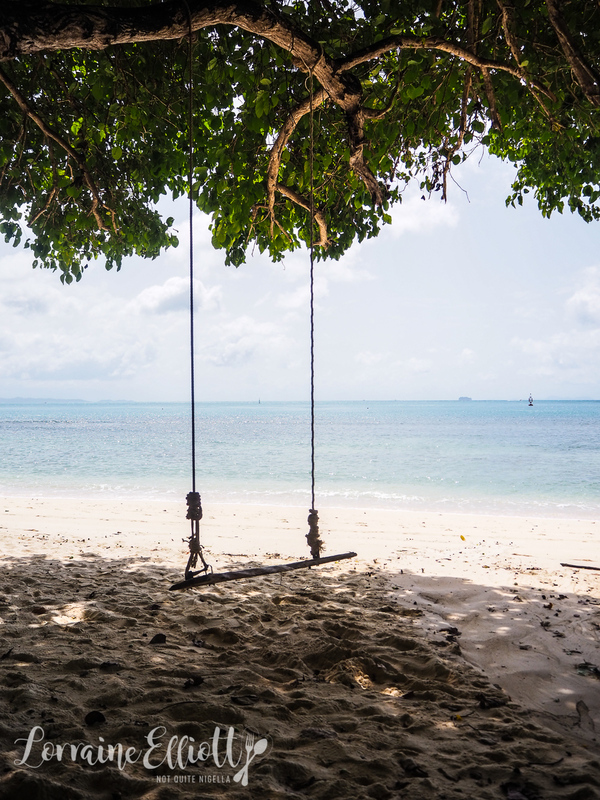 Namely lying on lounge chairs on the beach-I busy my time reading a book and researching where to eat while he reads and goes for a swim in the ocean. Come 1:30pm it's time for lunch so we go to Bamboo Bar the hotel's main beach bar, just behind where we are sitting and take a seat. 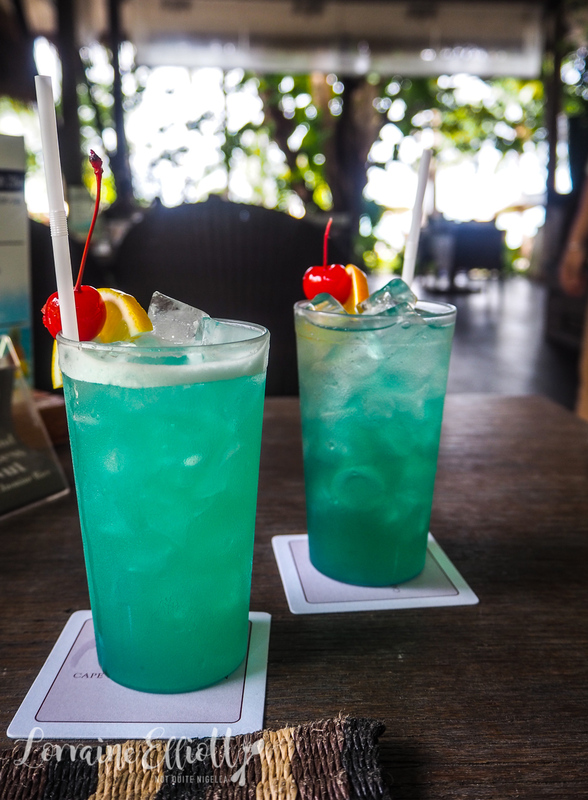 It's time for celebratory cocktails that pack a nice alcoholic punch with Thai fruit juice sweetness. The menu is made up of a range of Thai and Western dishes from burgers, fries, pizzas, pastas, curries and salads. We go for Thai food although a part of me would love to sink my teeth into a burger (but a Thai style one). My order is the Som Tum Salad which appealed to me in this weather but also because it comes with sticky rice which is just about my favourite rice ever. Although we were warned against ordering it spicy it isn't spicy at all so we have to get some chillies to add to it and then it's spicy and fresh. 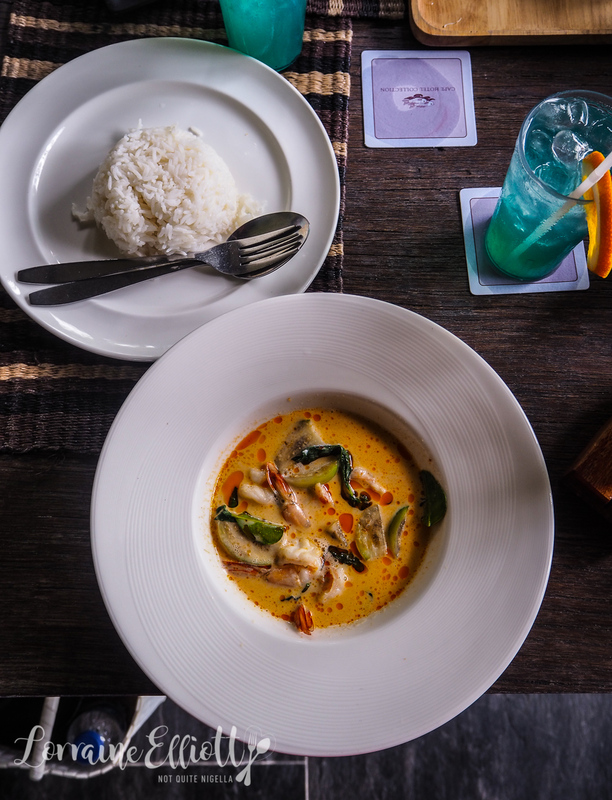 We both really enjoyed the red curry with prawns with half a dozen prawns and a sweet, creamy coconut base. I eat this with the sticky rice from the som tum rather than the jasmine rice given. The twister fries are dusted with paprika salt and come with a chipotle ketchup and sour cream. I also ordered a little side of the truffle mayo which I preferred to dip these into. I think some sweet chilli sauce would have been good with the sour cream rather than two types of ketchup. We can't go past the cake cabinet especially since I insist Mr NQN has a cake on his birthday. I choose the fruitiest number they have: a vanilla cheesecake topped with glistening sour cherries. And for good measure, a bowl of vanilla gelato. 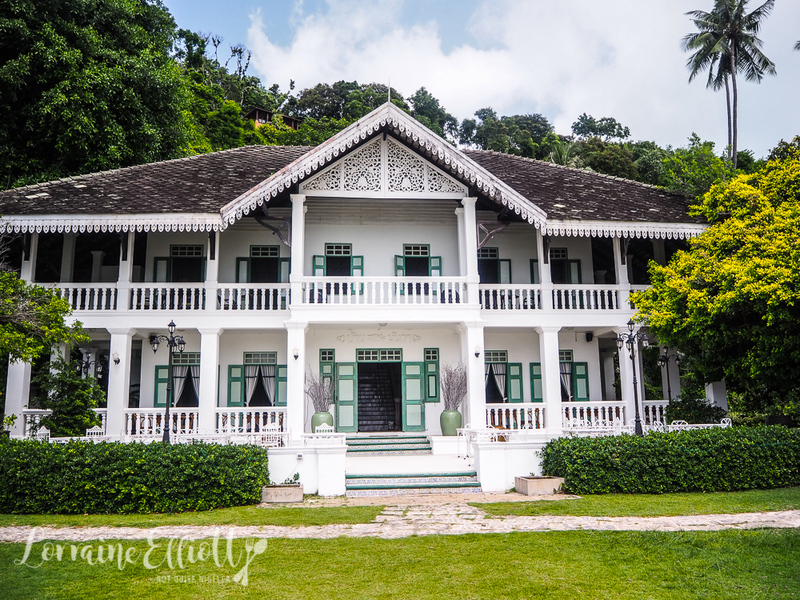 For dinner, Panwa House located by the beach is one of Cape Panwa's restaurants housed in a beautiful Sino Portuguese mansion. 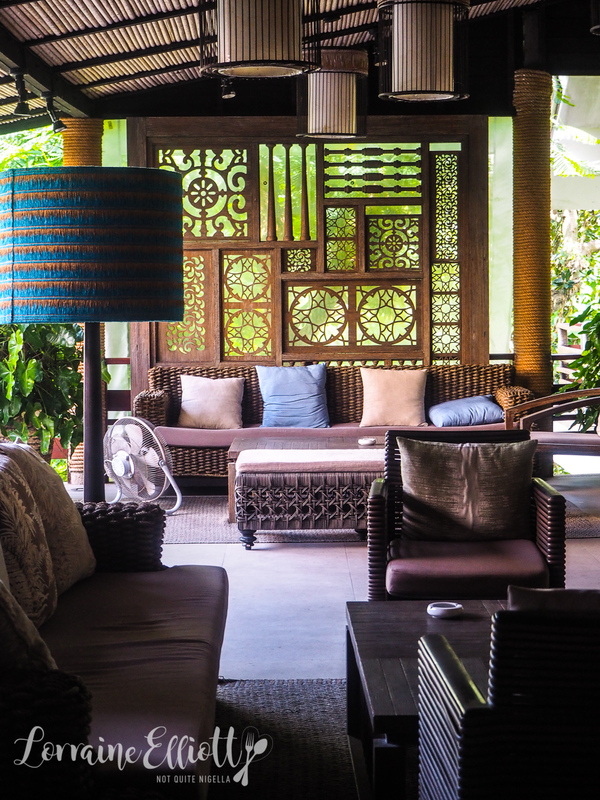 There is outdoor seating as well as indoor and we take a seat outside and order a couple of cocktails. 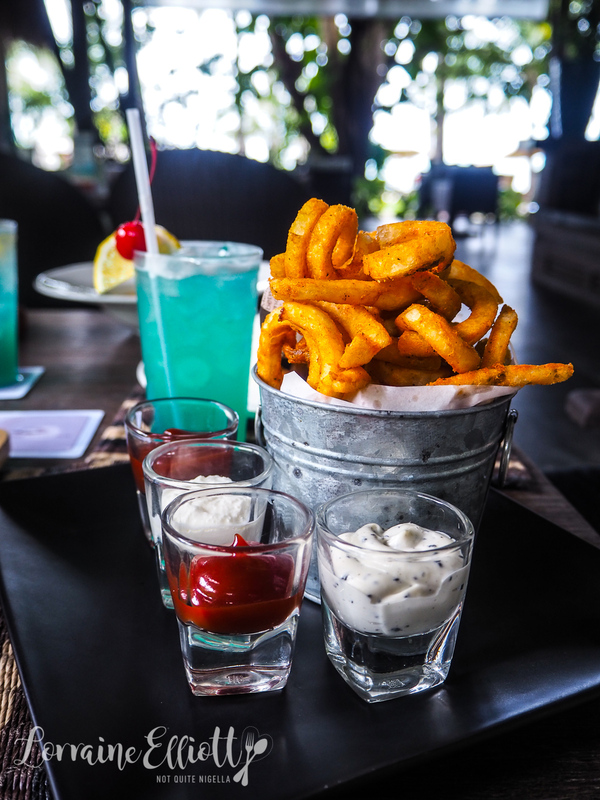 Service is a little inexperienced which is a surprise because this is their special occasion restaurant and there is a bit of confusion when ordering food. There is a touch of chaos as the monsoon weather drenches everyone and most of us have to be moved inside. We order a Tipsy Monkey cocktail which is supposed to come in a coconut but doesn't. 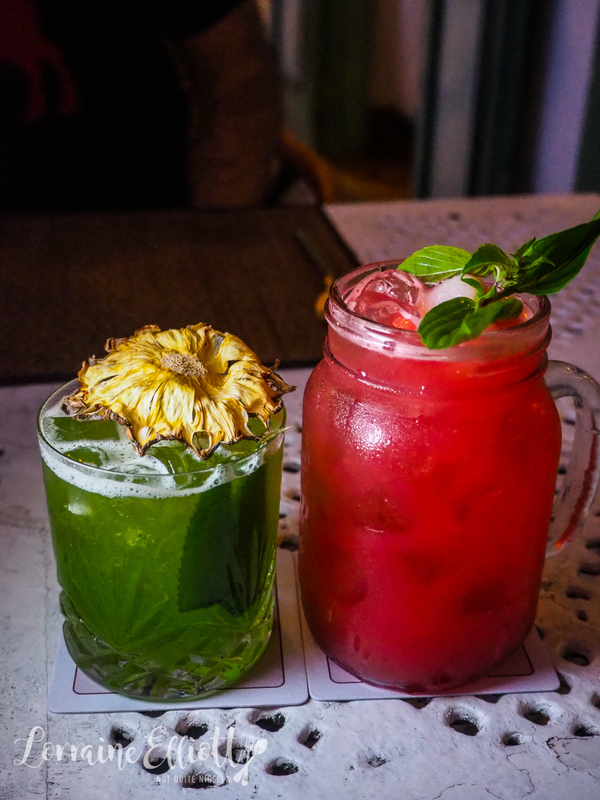 Nevertheless it is a nice cocktail with pandan flavours, Cape Panwa's own green tea liqueur and Malibu rum to it. The Top Secret Jam cocktail is made with lychees, watermelon and Cointreau. 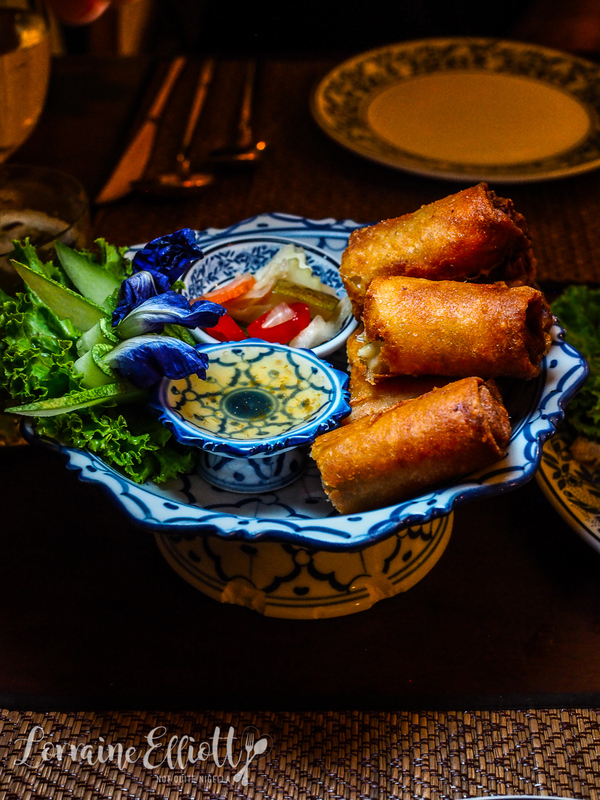 We start with crab spring rolls with a very sweet, syrupy plum sauce as well as pickled vegetables. The spring rolls are crunchy and freshly fried and I ask for some chillies to counter the very sweet sauce. 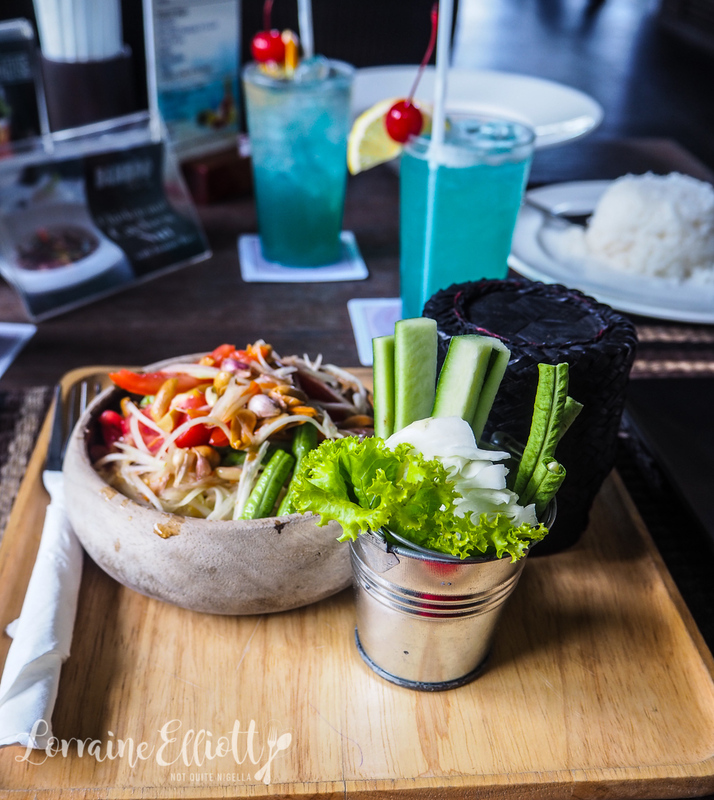 We also order one tasting platter set menu for 1480THB (there is also a daily set menu which makes for a lot of choice along with a full a la carte menu). 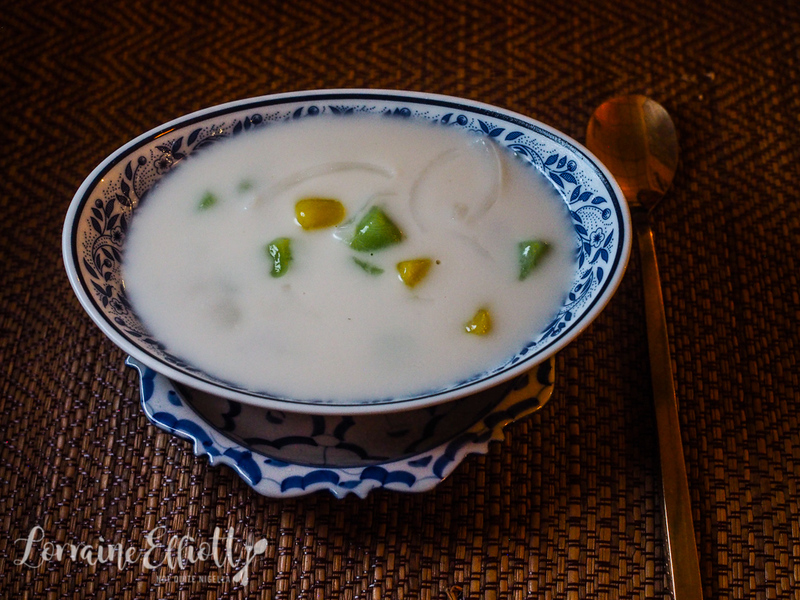 The first course is a choice of fruit salad or glass noodle salad with vegetables and we go for the latter which is good albeit a bit difficult to eat with a fork. For the other choice went for the lobster served as two halves with a tangy sweet and sour tamarind and onion sauce. The lobster tail meat is removed from the tail and stir fried and then put back in. The presentation is striking and I enjoy this with some sticky rice. 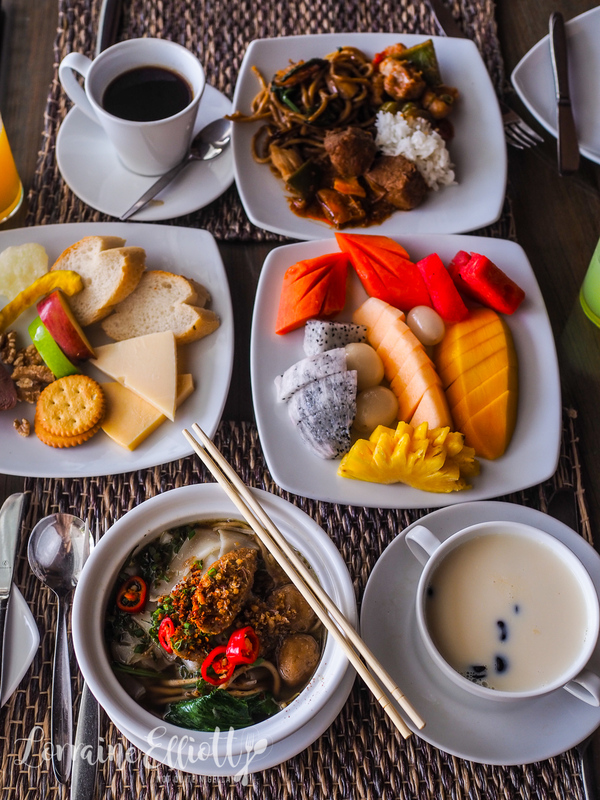 There are two set menus available, a Bangkok one with perhaps more familiar items like tom yum soup and fish cakes but we decided to go for the Southern platter as we like the cuisine so much as it's spicy and punchy. There are five little bowls of delicious little morsels. 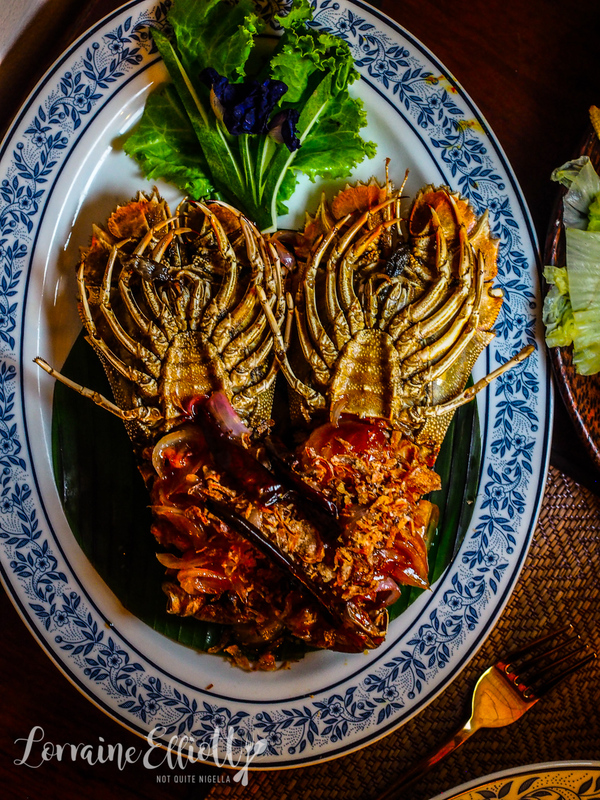 My favourites are the stir-fried crab with curry powder which is like a mild crab curry, a fried tiger prawn with tamarind sauce (like the lobster above) and the deep-fried fish fillet with lemongrass and kaffir lime leaf. 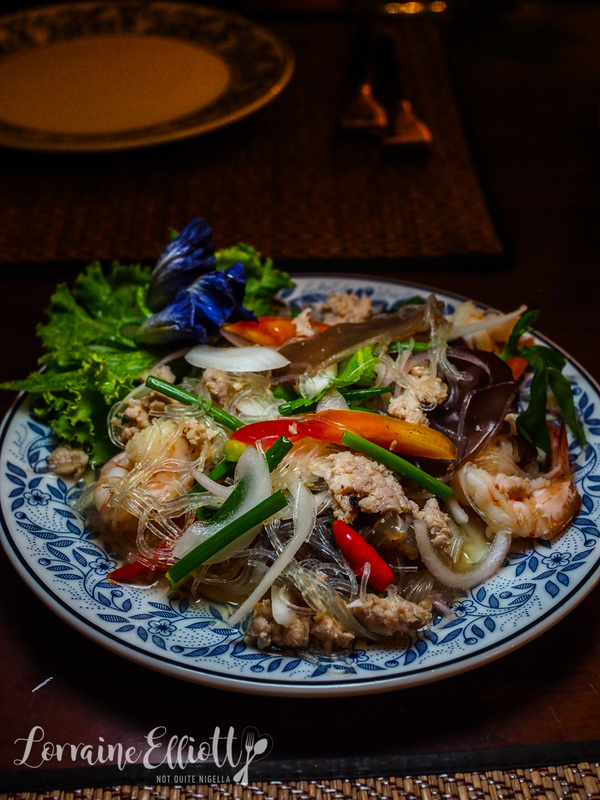 There is also a sour soup with a salmon fillet and young coconut shoots which is comforting and a salad platter with smoked shrimps (a Phuket specialty) with spicy shrimp paste and crudites like baby corn, fried eggplant and herbs. There's a lot of food-perhaps enough for two here as it also comes with rice. There is also a choice of soft drink with this menu (although we had to ask for it, it wasn't offered to us) and we go for the longan drink which is syrupy sweet. It's time for dessert and I knew exactly what I wanted as it's one of my favourite desserts. It's on the set menu and it's a simple dessert of mini mochi rice flour dumplings in sweet coconut cream. I could eat this every night and it's pure comfort food. 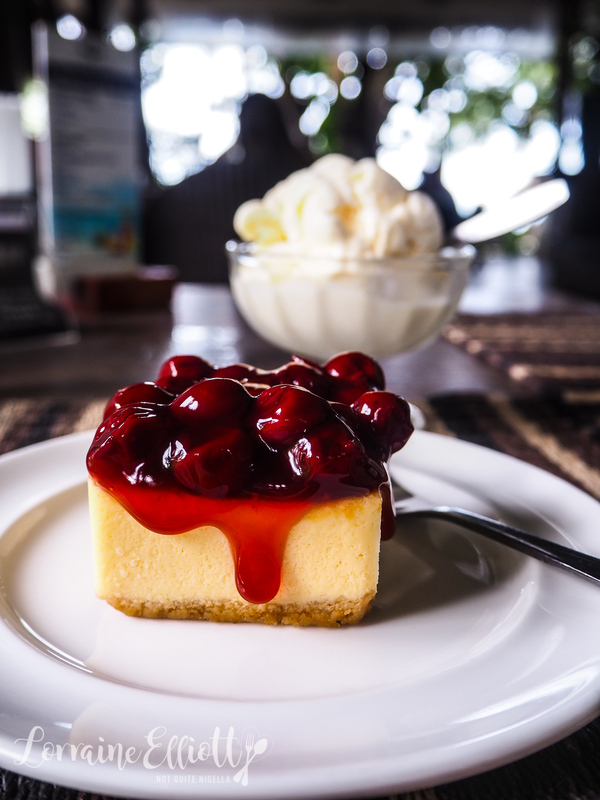 I've had this dessert in Koh Samui and adored it. 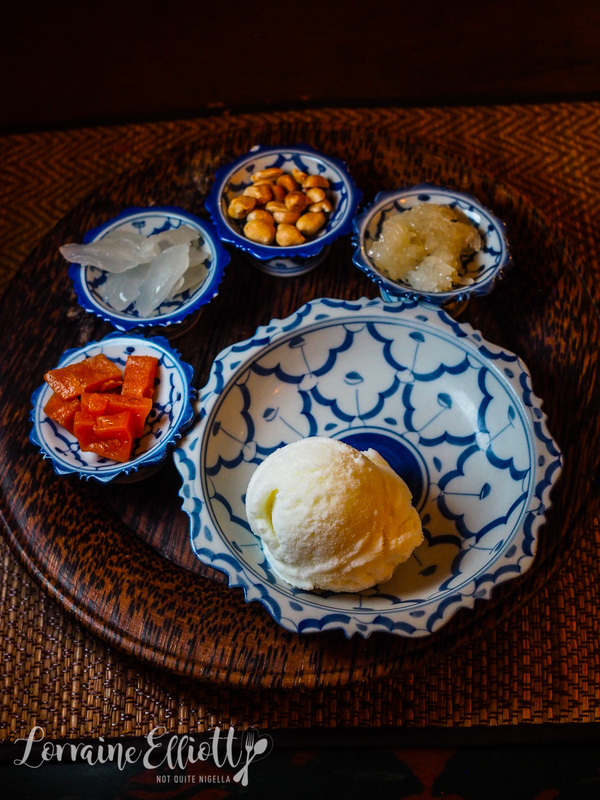 It's a scoop of coconut ice cream served with syrupy palm seeds, sweet sticky rice, poached sweet potato and crunchy peanuts. I add the mix ins to the ice cream and it's a bit crunchy, soft, creamy and sweet at the same time. The rain has let up so we make a quick dash up to the tram and to our suite! 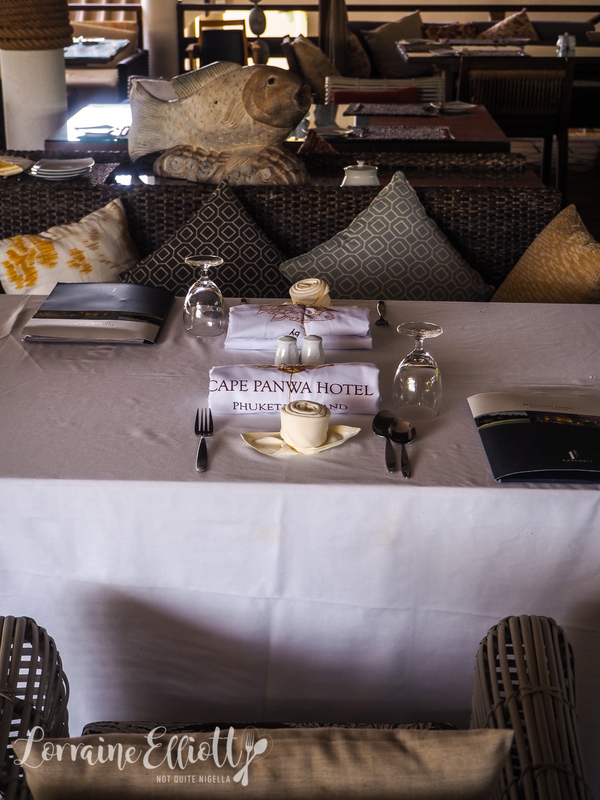 Cape Panwa also offers a 2 day cooking class over Fridays and Saturdays. 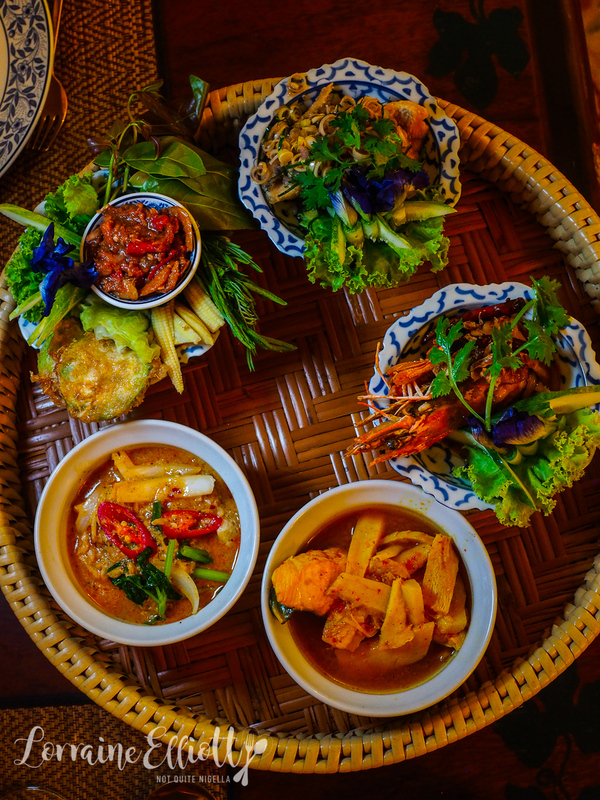 For the first day you get an intro to the classics of Thai cuisine like Tom Yum Goong, Green Curry and Thai beef salad as well as a sheaf of 30 recipes. And for the second day you get to choose which dishes you would like to make. 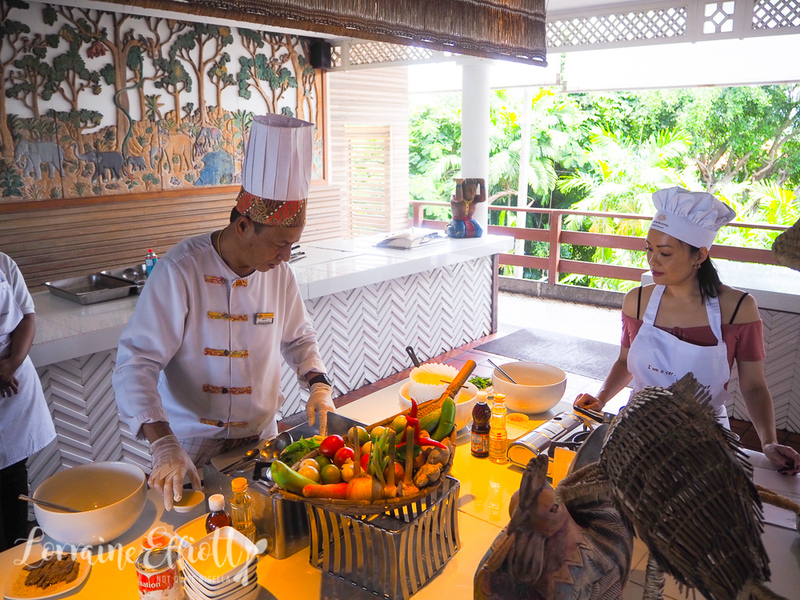 Plus you get to take home your own apron and chef's hat as well as feasting on everything that you've cooked. Chef Kan is in charge of the hands on cooking class. We make most of it ourselves but all the measuring is done for us which makes the class easy and fast. 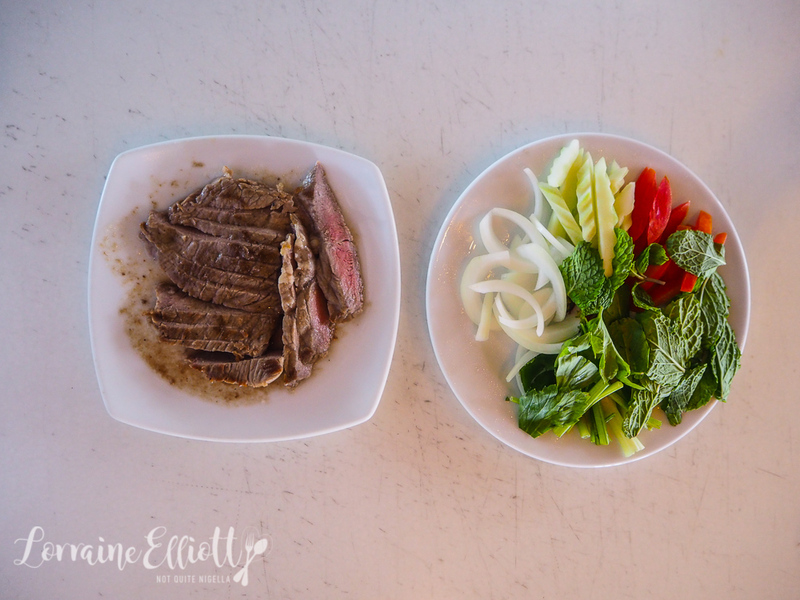 We start with the Thai beef salad and then move into the tom yum goong. He gives us tips like always crush kaffir lime leaves before you add them to a recipe if you use them whole. 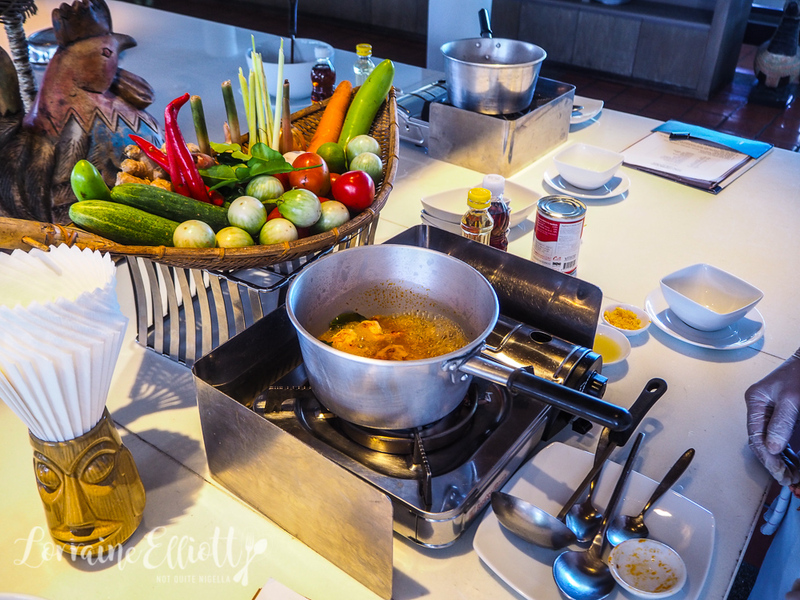 He also explains that there are two types of tom yum goong: a clear and a creamy. The creamy one has two additional ingredients added to it-a smoked chilli paste and some evaporated milk. He asks us to try the clear first and then he mixes up a creamy version which he then asks us to try. The spicier, creamy version is both of our favourites so we go for that one. The last item we are making is a sweet green chicken curry. They use chicken breast in the cooking class although Chef Kan tells us that they usually make it with chicken thigh or chicken wings on the bone. There are two types of eggplant in it-the white or crispy eggplant as well as tiny pea eggplants. 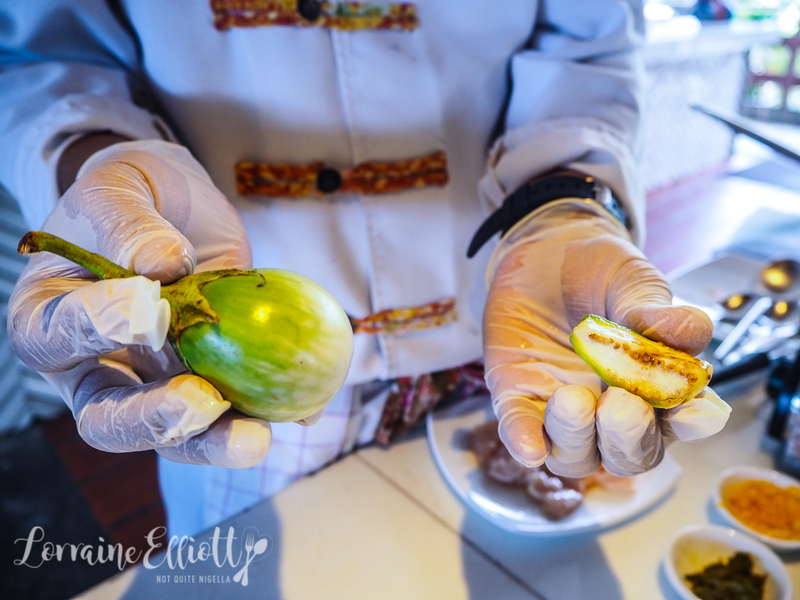 He explains that the white eggplant can be eaten fresh, like an apple or used in crudites or dipped in a spiced salt mixture. The green curry is delicious (and there's also a recipe for the green curry paste). We sit down and feast everything that we've made. 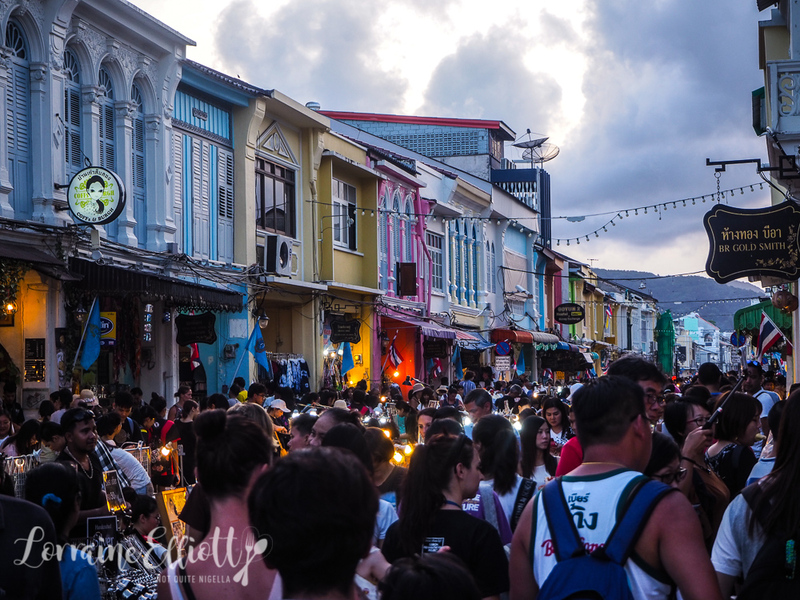 One night we also head out to the Sunday Walking Markets which is a busy attraction in Phuket's Old Town. It's crowded, hectic but replete with eating opportunities. 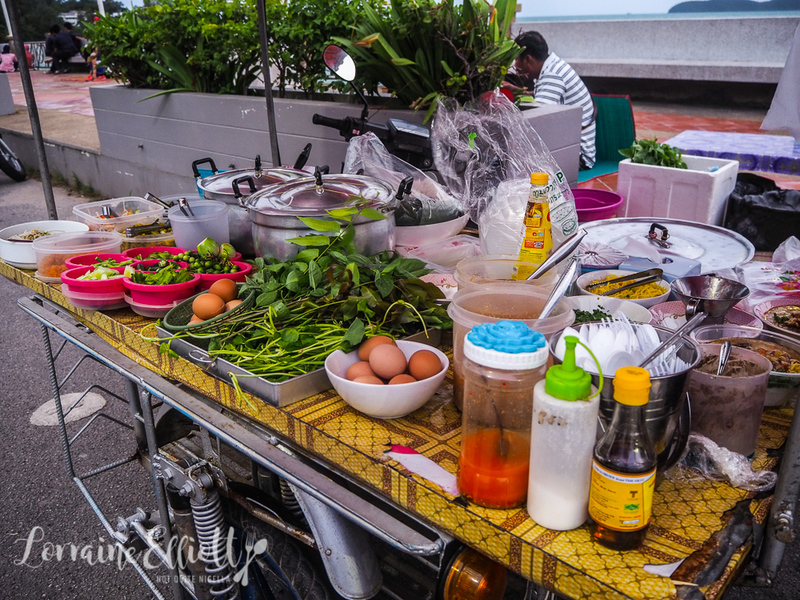 Getting to Phuket's Old Town isn't cheap for Thai standards, it's around $20AUD/500THB each way. It isn't easy to hail taxis (there's a real shortage of metered taxis) so do take up the offer for a return ride. 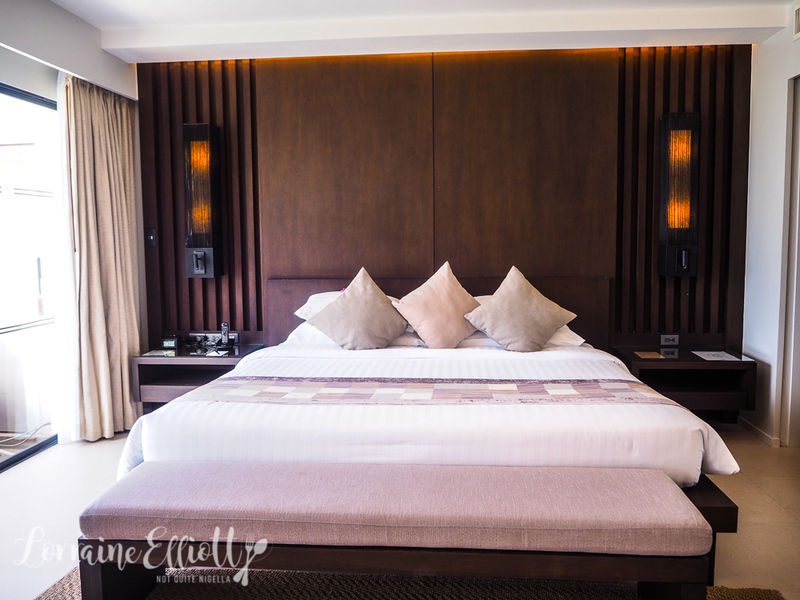 One of the main things about resorts in Phuket is that you tend to stay at your resort. 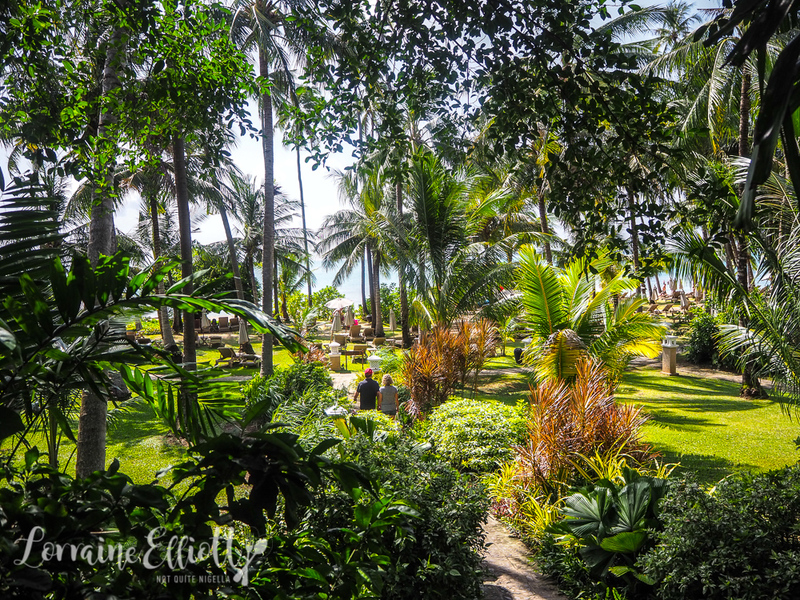 Transport around Phuket is expensive, said to be the most expensive in Thailand and controlled by various interests to ensure that to travel anywhere at a distance, will cost you around $50AUD return. 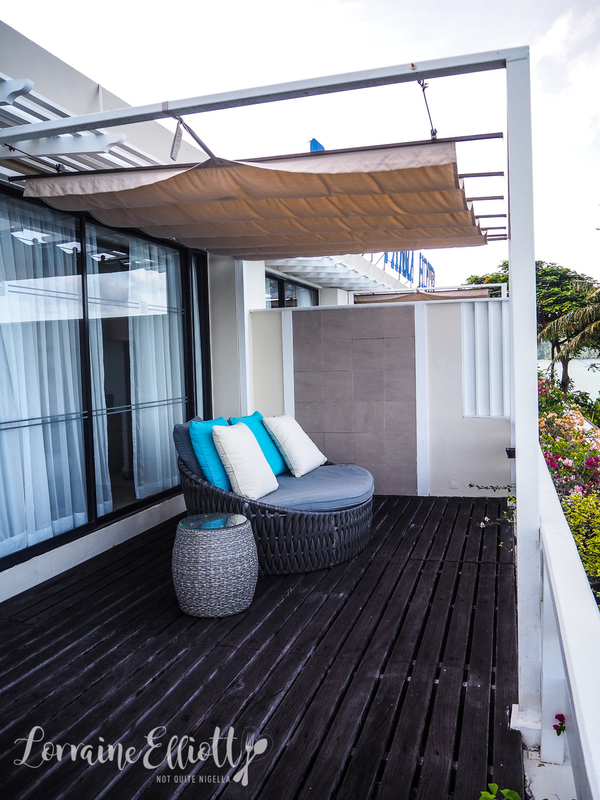 Because of this, resorts outside of Old Town and Patong tend to have shopping and dining areas within easy walking distance that offer hotel guests an alternative to hotel dining and entertainment. Cape Panwa has one at the bottom of the steep hill and a shuttle bus operates up and down every 15-20 minutes. There's a small supermarket as well as a Cafe Kantary that sells coffee and tea as well as bakery items, sandwiches, pizza and cakes. There are also massage places dotted along the hill and we sit back and unkink from the flight, muscles happily relaxing as we submit to the pressure from the therapists while we wonder what they talk about with each other as they massage us. 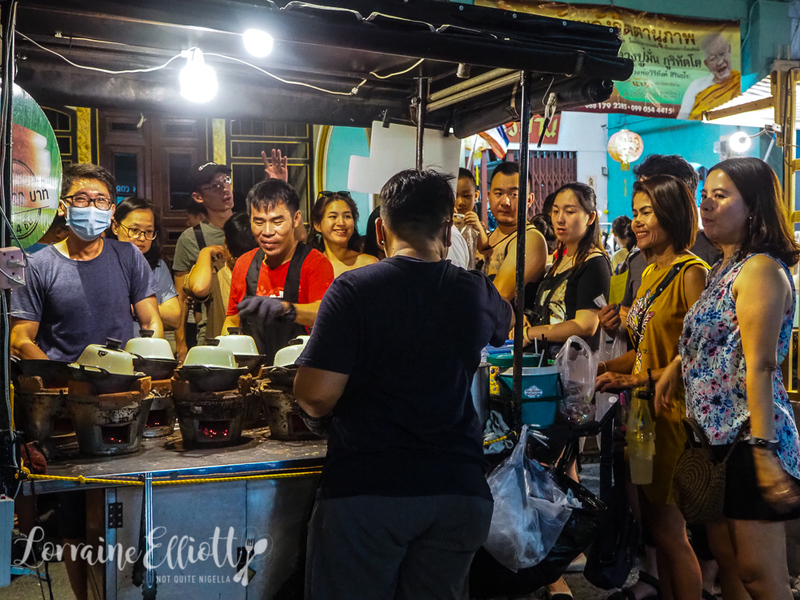 Afterwards we buy some snacks and fruit from the street vendors including 10 sweet tiny pineapples and a kilo of longans for 100THB or $4AUD each. Mangosteens are pricier at around $12AUD a kilo but it's so inexpensive compared to what they cost in Australia. 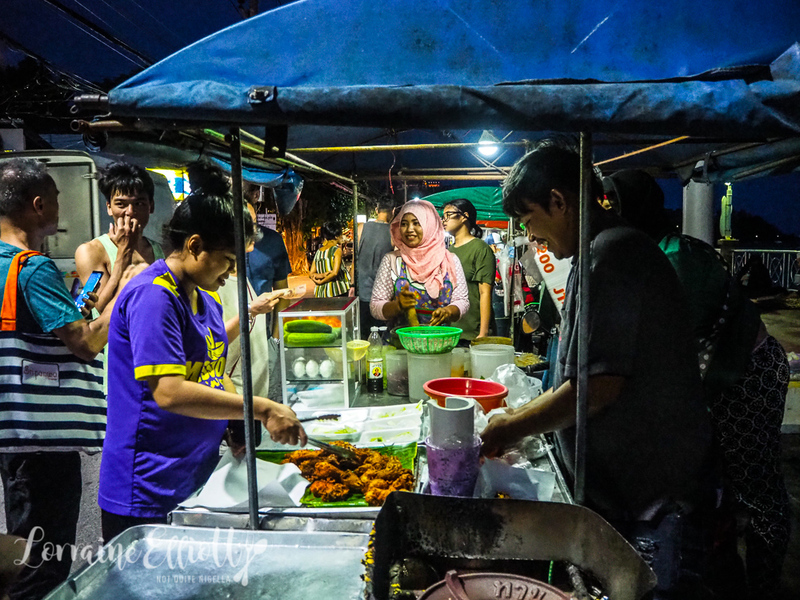 Come later that night, the street vendors will come out around 5pm and set up and sell hot, smoking food. 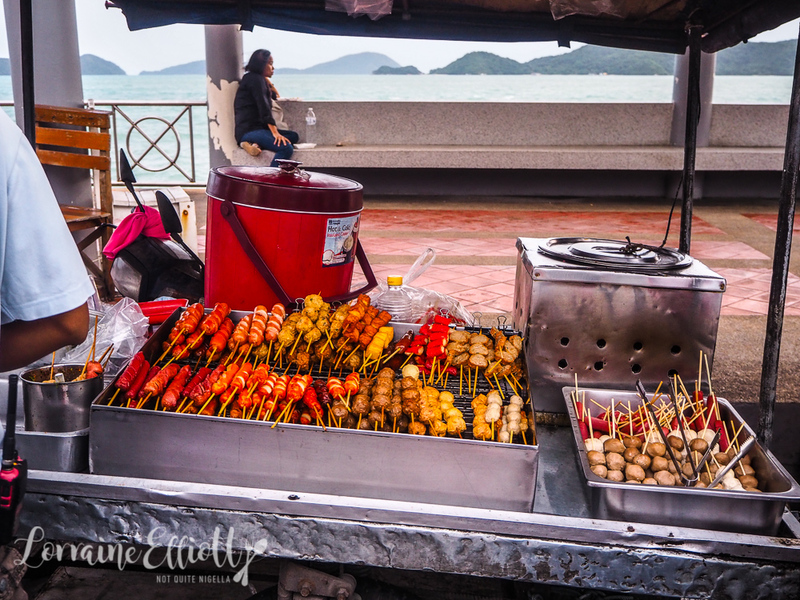 We buy som tum from a vendor who is the most popular stall on the pier. Even with 10 orders she makes each serve of som tum individually adding each ingredient painstakingly. Many of the vendors are lovely Muslim women who are friendly and welcoming. 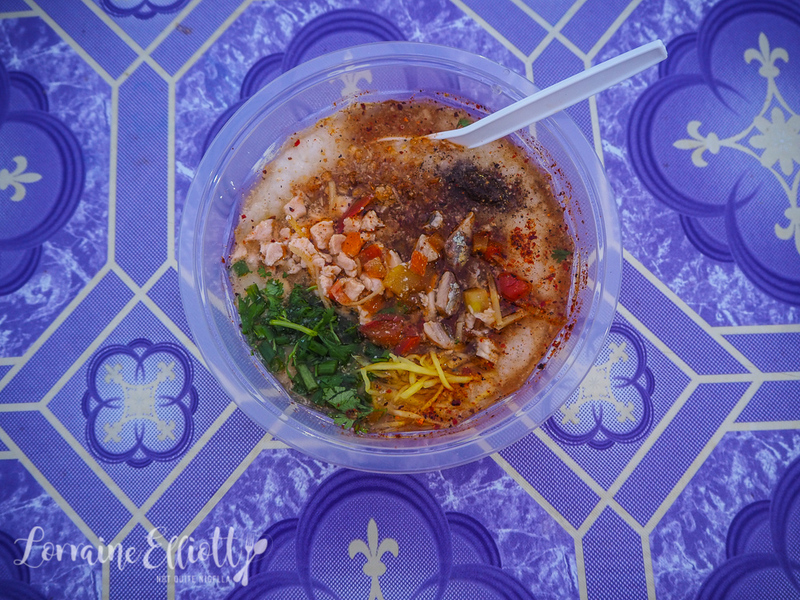 We try some wonderful congee with fish and chicken added to it along with a range of spices and peppers. We are invited to take a seat along the boardwalk and tuck our feet under a small table and eat. 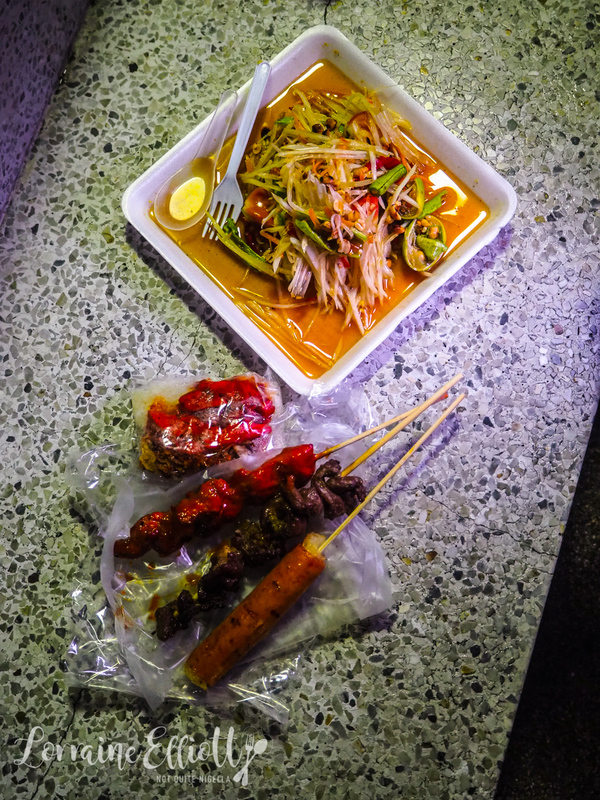 The food is delicious and the warm humidity tempered by the seabreeze. So tell me Dear Reader, do you tend to eat at the hotel or go out to eat? 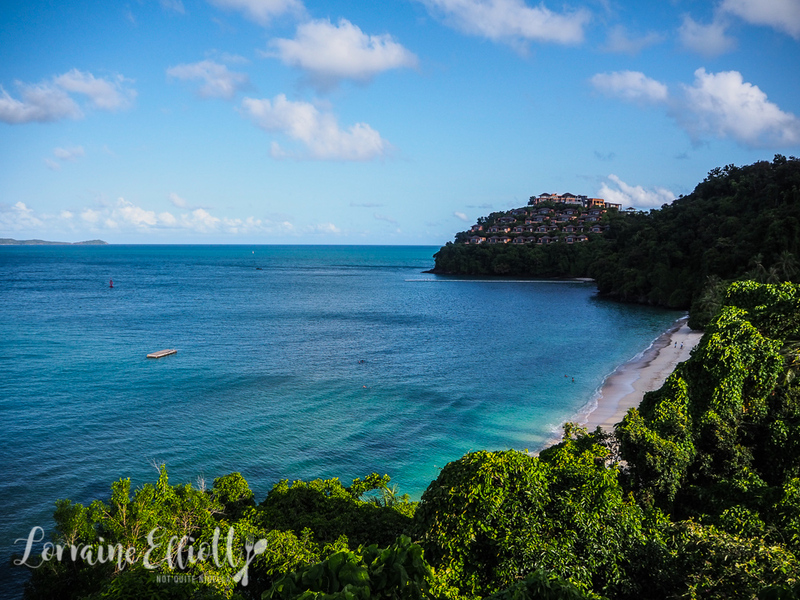 Have you ever visited Phuket? And do you do cooking classes while on holidays? NQN and Mr NQN stayed as guests of Cape Panwa but all opinions remain her own and meals outside the hotel were independently paid for.